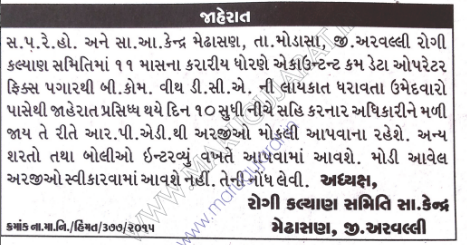 Rogi Kalyan Samiti, Arvalli has published a Advertisement for below mentioned Posts 2015. Check below for more details. Educational Qualification : B.com with D.C.A. Address to sent Applications : Rogi Kalyan Samiti, Arogya Kendra, Medhasana, Arvalli.